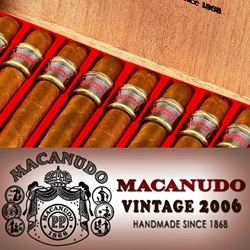 Macanudo has delivered once again with another great premium cigar from its Vintage 2006 crop. The 2006 line offers the same qualities, and craftsmanship as its predecessors making this hand-rolled premium cigar another masterpiece. This cigar is beautifully complexed and stocked full of fillers from the Dominican Republic, Honduras, and Nicaragua. Its binder consist of a smooth Connecticut Habano leaf and wrapped up in an aged US Connecticut Shade that gives it the final touch. This handmade cigar is constructed so well and feels so extremely smooth, it's almost vein-less. Once ignited the taste of light vanilla, cream with a sweet overtone hit your taste buds all at once. Smokers Discounts has made it easy and affordable to buy premium cigars online. Every product can be delivered right to your doorstep. A variety of sizes and flavors are listed below. Each of these styles are in stock and available for a discount price! Call us for more details!